Have you ever run a race where you feel like you are coming home each time you complete it? Well that is how I feel about the Disneyland Star Wars 5k. 2017 marked the third-consecutive time I have toed the line for this fun event. For 2017, we opted the splurge and stay at the official Disneyland Hotel for the first night we were in town. Friends this was truly magical. I wish we could afford to stay there every night we are out in Anaheim. Amazing hotel... and SUPER close to the Start area. Since life was crazy hectic, we didn't have enough time to make 3 different race costumes so I re-used the Rey costume for the third time. As you can see above I wore it for the 5k last year and I wore it for the Dark Side Half Marathon last April. The wife rocked making that costume so I needed to get the most out of it. Since we don't have a Star Wars race on the calendar for awhile it can officially be retired. I kissed the wife and headed out to the race. I totally forgot to take a pre-race photo. I know I know! What was I thinking? Disneyland added metal detectors at the opening of Downtown Disney which clogged up the entrance. I heard they had been added about a month ago, but the team behind it was still working on getting the system down. It definitely wasn't as smooth as security at Disney World, but I am sure they will get there in time. I took a mental reminder to add additional time the following two days as each race had more participants than the previous one. I made it through security and walked through the Start Area quickly. Instead of hanging there since I didn't have anyone to meet, I started the walk to Corral A. Thankfully the walk isn't as long as it is in Disney World, but it was still a good 1/2 a mile or so. I was able to wiggle my way up to the second row of people behind the Start Line barricade. I love being up close to the announcer stage. The Disneyland 5k is an untimed event not that I ever care about time at Disney races. :) I usually aim for them to be my worst finish times because it means I was out there having a ton of fun and waiting in character stops. ;) I know not many people aim to have their worst times at races, but I am not normal. I know that. Haha. Carissa did an amazing job as always with announcing. But she had to take a quick trip and someone a little more evil took over! I love the pre-run show. :) Makes me smile every time. Before I knew it it was time to kick off the wheelchair participants. If anything Disney knows how to send off a corral. Just moments it was our turn for the fun! This race I have no problem as people blaze past me at the Start. :) I know there are a ton of people doing these races for time and aren't stopping for characters or there are people that want to run to a specific character line so they don't have to wait too long. I try to be conservative since I know I have 2 additional days of racing and lots of park walking. Well with zero character stops within the first mile I was able to flush the legs out and take in the scenes. We started off by running through Cars Land. After weaving through Cars Land, we made our way through Bugs Land which is where we hit Mile 1. And immediately after that we hit our first character stop! :) Why hello there R2D2!! Always fun to snap a pic with this droid. After a quick hello to R2D2, it was time to run past one of my favorite views in both Disney locations: the Ferris Wheel at Paradise Pier. Oh no there was a bear on way towards the main fountain of the park. He wasn't too jazzed about taking a selfie with me. Does this look a little Blair Witch Project? I think my phone was a little sweaty. After passing the main fountain in California Adventures, we headed down the main street. Sorry for the blurry pic, but with the lights I am never able to get a good shot. We took a left at the end of the street and headed towards what was Hollywood Tower of Terror (which is closed). But before we got there there was a photo op with a speeder. Of course I had to stop. Just after that stop we hit Mile 2 as we made our way out of California Adventures and on our way to Disneyland to finish the race. We entered Disneyland through Tomorrowland and were greeted by a couple of Stormtroopers. I should've figured out who the net character stop was with Stormtroppers around, but I was still shocked and psyched to see Darth Vader around the bend. With a big smile on my face I headed towards another of my favorite views, Sleeping Beauty's Castle. Its breathtaking isn't it? Especially before 6am when few people are around. When I turned around, it was time to run down Main Street. I really need to improve the camera on my phone because it doesn't work well on the streets with a ton of lights. But we were greeted at the end of the street with Chewie! Gotta save one of my favorite character stops for last... of course! Once I said bye to Chewie, it was unfortunately time to leave Disneyland and make our way through Downtown Disney as we headed toward the Finish in the parking lot of the Disneyland Hotel. We took a quick right and headed straight to the Finish. That view never gets old. Run Disney has the Finish Line chute down to a science: bling, water, Gatorade, heat blanket, past the med tent in case you need to stop and finally SNACKS!!!! Once I grabbed my snack, I headed to meet Tori at the Starbucks. How amazing is that bling? This is my second Run Disney 5k where we received a real medal instead of the plastic medallion. I kind of missed the medallion, but this was pretty freakin' sweet. Thank you Run Disney for another amazing Disneyland Star Wars 5k! I will miss running this race in 2018 (as we will be doing marathon weekend instead), but we will be back for sure! 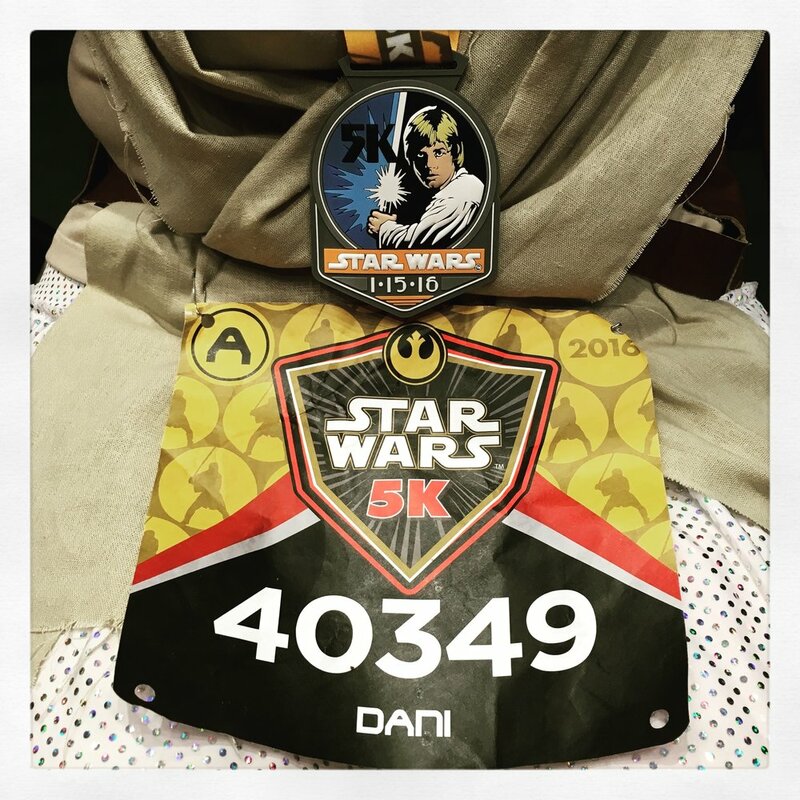 Did you run the Star Wars 5k? What was your favorite part?